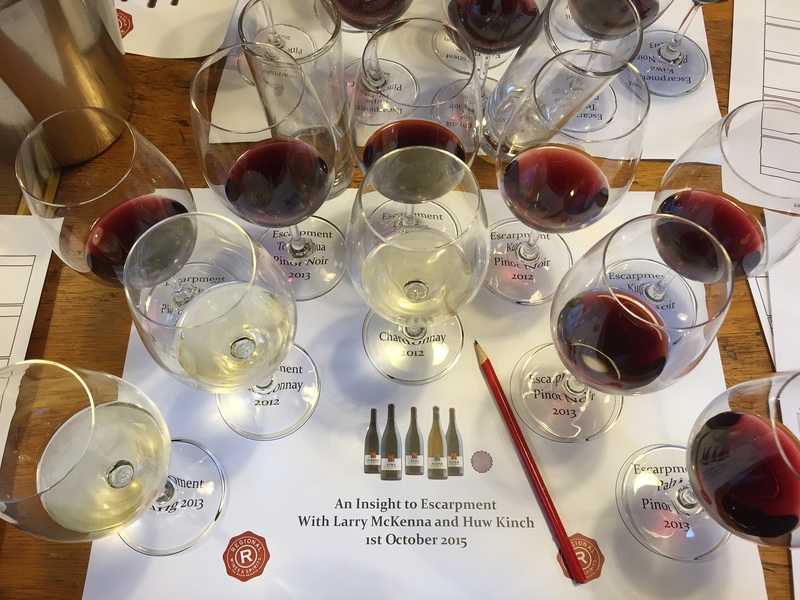 Escarpment Martinborough Tasting, and the superlative 2013 Kupe Pinot Noir. Another tasting at my favourite bottle store Regional Wines and Spirits, hosted by Richard Sheriff. I remember vividly the last time I tasted a horizontal of Larry McKenna’s wines. He produces some great ones. I recall being really taken with his Pahi Pinot Noir back then, and still have a bottle of it in the Pool Room. 2012 Escarpment Kupe Chardonnay – Single vineyard Chardonnay. 25% new oak with full malo treatment. Floral bouquet with vanilla and honey, slightly sweet. To drink it tasted tight and angular, locked-in, almost unfinished in a way. Ended on the bitter side. A much different wine to the estate wine just before it, and not as successful to my taste. 2013 Escarpment Pinot Noir – 50% whole bunch fermentation. Deep carmine colour. The ‘district’ blend. Notes of black cherries on the nose, a little closed. ‘Hay’-like typicity. To taste – dusty, smooth, with ripe fruit, fine tannins, and a light spicy finish. Nice. 2012 Escarpment Kupe Pinot Noir – 35% whole bunch fermentation. Brownish deep carmine. The nose exhibits bright medicinal top notes, with some tertiary evidence of age beginning to show. Slightly stalky to taste (it was a cool wet vintage), less fruit on show, and savoury. SV elegance, with structure. 2011 Escarpment Kupe Pinot Noir – 70% whole bunch fermentation. Brownish deep carmine. Somewhat closed nose. An attractive medicinal character peeks through. There is power and intensity on palate, supported by fruit ripeness. The tannins are grippy and crystalline. Shows the benefit, yet again, of a superb vineyard site. This tasting was held the night before my wedding. A very kind and thoughtful friend, GN, who was there also, made a gift of a bottle of 2013 Escarpment Pahi Pinot Noir to me and my wife L, and delivered it to the venue the following day. Thank you very much, G. You must come over sometime soon and help me drink the ’10. This entry was tagged Chardonnay, Escarpment, Pinot Noir, Riesling, Tasting, Wine of New Zealand. Bookmark the permalink.